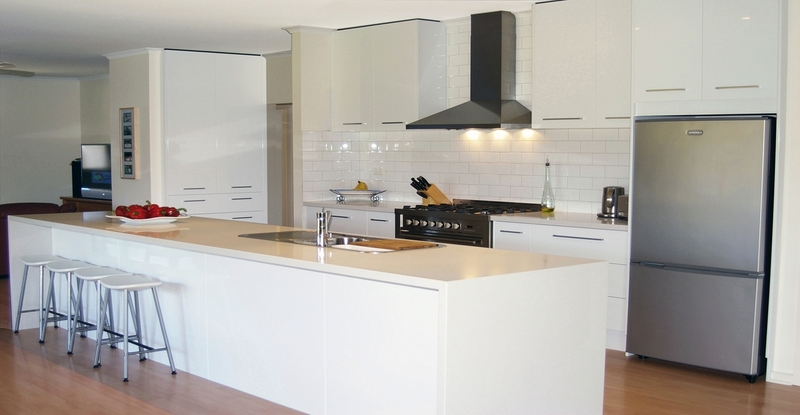 Reconstituted Stone Benchtops are made up of approximately 95% crushed stone particles that are blended with 5% Polyester Resin. There are different manufacturers who use different types of stone which include those of Granites, Quartz, and Marble. 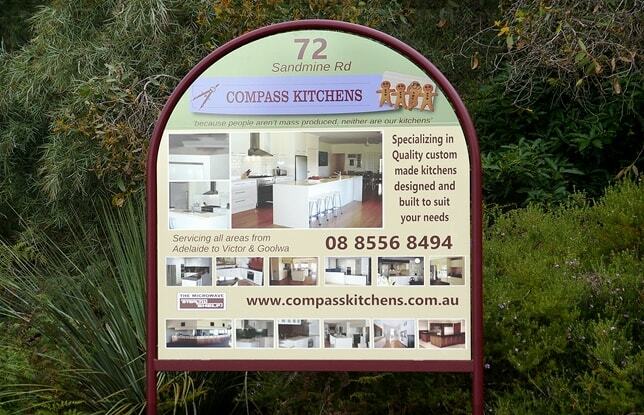 The availability of Reconstituted Stone products in South Australia include the brands of Essastone, Quarella, Caesarstone, Silestone, and Stone Italiana, who between them make slabs of 12mm, 20mm, and some in 30mm thick; where counter tops can then be built up to any thickness you desire. Each manufacturer has their own wide range of colours, styles and finishes, to include a range of fashion colours that aren't available in natural granites. 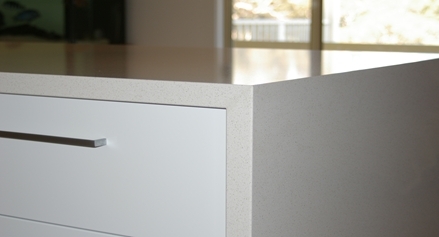 Reconstituted Stone Benchtops have visible joints just like natural Granite but with the use of modern tooling and adhesives these Joints are quite inconspicuous. 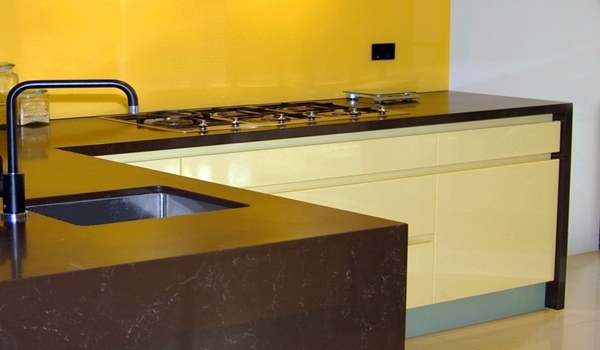 These Reconstituted Stone materials are very hard wearing, much like a natural granite surface. 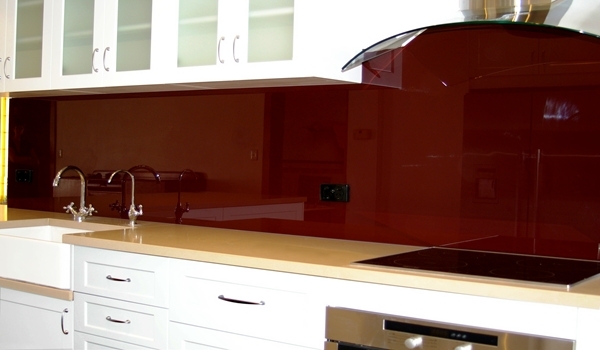 They are honed to a reasonable gloss level but they can't match the high gloss or translucency of natural granites. Reconstituted Stone is heat and flame resistant, and most cannot be thermoformed for bending. The manufacturers of CaesarStone have however now developed a product that can be bent. 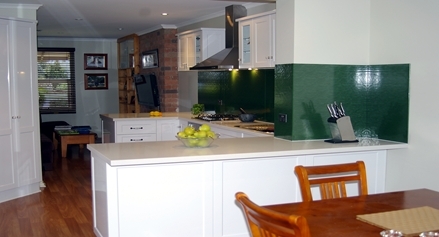 Manmade Reconstituted Stone makes an elegant, durable, low maintenance Benchtop surface that is uniform in its colour and its pattern. 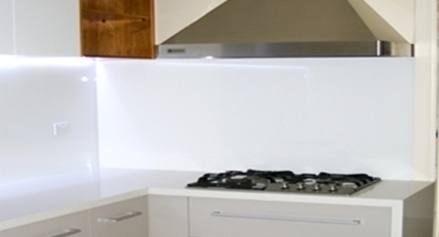 Reconstituted Benchtops are very strong and have even greater crack resistance than natural granite. They are scratch, and water resistant, have a high degree of heat and burn resistance, are impervious to stains and will withstand a great deal of wear and tear, and do not require periodic sealing like natural granite does. The reconstituted marble is not quite so hard wearing, with the manufacturers recommending it be used more in the furniture, bathroom and laundry situations. 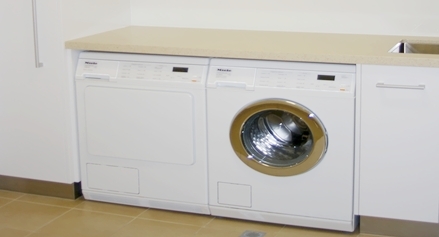 Reconstituted Stone is popular for its style, its versatility and easy care features. Blending itself comfortably into all kitchen designs ranging from simple uncluttered Contemporary styling, right through to those Kitchens with a more Traditional Classic look.